KAI is our third generation Great Dane, and is a "Deli" grandson and a "Rush" son. Kai was imported from Denmark and is owned and loved by Tianna Langelotz. 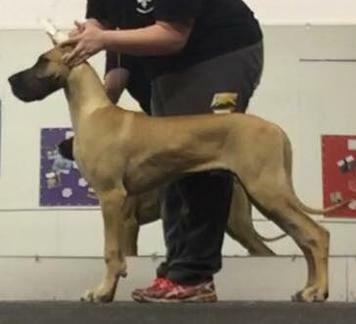 Kai was bred by Gitte Kallesoe Jorgensen (Kennel Royal Jazz) of Denmark. Kai took to the IABCA ring at 4 months of age for some experience and came home an International and National Baby Champion with consistent placements in the puppy group against much older puppies. He then made his baby puppy debut in Canada at 5 months and won two best baby puppy in group and a best baby puppy in show his first weekend out! His first weekend out as a class dog, Kai came home halfway done his Canadian Championship with wins including a nice Best of Breed. He then completed his Canadian Championship by eleven months of age. Kai will now be enjoying life outside of the ring and partaking in events such as "Sprinter".